﻿ My coordination has greatly improved in Kunyu mountain academy. I have always been interested in Martial Arts. Studying Kung Fu full time for about a year was a dream and it seemed impossible until I discovered this academy. This is an academy with highly trained Chinese Shifus for international students and it's not expensive, I can actually afford staying here for a while! In these 10 months of training I have learned a lot. 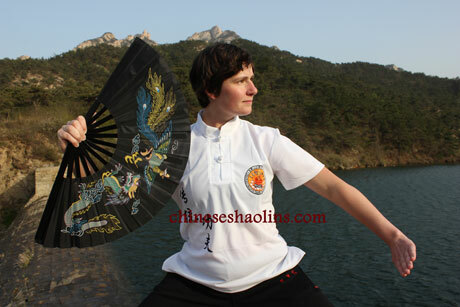 Physically: I have learned the basics of Shaolin Kung Fu as well as Taiji, Qigong and Sanda. My coordination has greatly improved and so have my balance, flexibility and fitness. As a nice side effect I have also lost a lot of weight. More important to me is what I have learned mentally: I have become more disciplined and self confident. Where I used to see a problem, I now see a challenge that will make me stronger. Probably the most important thing I learned here was the little expression “not yet”. If you asked me 10 months ago whether I can do a kick up or not, I would have said: “No, never!” Three months later I answered the same question with “not yet” and today I can actually do it. And there are many other things where I thought: “I can never do it” and now I can. So today I don't say no anymore, I say “not yet”. I consider myself very lucky to have been assigned to Shifu Gao’s group. He is not only a great martial artist but also a great teacher. He knows how to push his students so we get better and better. And he somehow manages to keep the spirit of the group up so we enjoy the training most of the time. The people from my group are also really cool. In the beginning of my stay I had no idea what I was doing and the older students helped me a lot to fit in. That's how it works in this group and also in the whole school: the people here are supporting each other. I also find it impressive that there are generally no problems between people from very different backgrounds. Everybody is respected here as long as they are ready to work hard. Life is simple in the academy in Kunyu Shan. Every week looks about the same, so you always know what you can expect and what you are expected to do. You don't have to remember a to-do list or any appointments, your only responsibility is to show up for training punctually and to behave appropriately. For me that was a relief. Back home there is always so much to remember. Here I only have to do one thing: training. This way I can really focus on training, there are hardly any distractions. This is probably also one of the reasons why the training in this academy is so effective. I love living in this academy. Both the masters and translators are very kind people, always ready to help you. The masters are all very qualified. Some of the translators don't speak English perfectly, but they are always good enough to communicate. The surroundings of the academy are beautiful. There are the mountains around the academy which look awesome no matter in which season you come here. The air is good and there is a very nice lake nearby where we can go to swim in summer. In fact I love everything in this academy except the food. Turns out I don't like Chinese food a lot. But that was no problem, because in each season you can buy fruits from in the area – and the local farmers sell them surprisingly cheap. If you read this feedback because you are thinking about coming to this academy, I have some hints that might be useful for you. A) Before you come here please ask yourself one question: Do you want to train, work hard and learn something or do you want to have a nice holiday? If you are looking for a nice holiday, this is not the right place for you. You won't be happy here and you probably won't get along well with the people here. If you are ready to train hard, you will have an awesome time here. You will gain a lot and spend your time with great people. You will be happy that the rooms are simple and there are no distractions. You will see that training in summer as well as in winter makes you stronger. B) Bring your own running shoes, but buy training shoes here. And of course: run in your running shoes, train in your training shoes. This might not make a big difference in other sports, but for Kung Fu running shoes are really not suitable. And on the other hand running in Kung Fu training shoes might hurt your ankles. It also helps a lot to start running regularly before you come here. C) You can learn many different styles of Chinese Martial Arts in this academy. Optional classes: No matter in which group you train, you can always join optional classes in Tai Chi, Qigong, Xingi, Mandarin, massaging, acupuncture and Taoism. D) In China everything connected to Google is blocked. That means you cannot use any Google-products. For example you cannot use Gmail, Google-Chrome, Google-maps, Google-translator, Facebook, Youtube and Dropbox – unless you have a VPN (for example “Express VPN”).